I am new to Kat Burki and am just starting to explore all the goodness of this brand. Using Applied Nutritional Sciences, Kat Burki hopes to deliver the most effective formulations through technology and cutting-edge nutritional research and concepts. 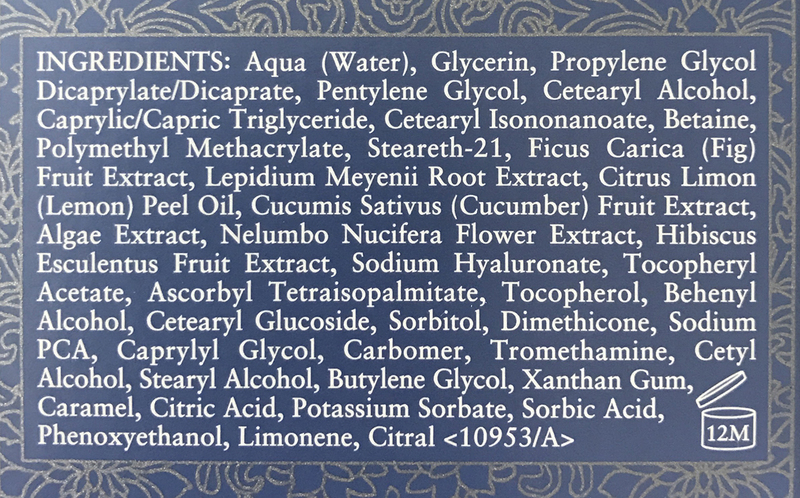 This is “clean” brand that does not use parabens, petrolatum, synthetic fragrances, phthalates, mineral oils, gluten, synthetic dyes, fillers + binders, sulfates, and silicone. The Vitamin C Intensive Face Cream is a cult classic and is formulated with 15% STAY C, a stable form of Vitamin C, powered by the anti-aging powerhouse Reishi Mushroom for greater absorption. Though it has a slightly thick consistency, it soothes my face and is well absorbed without leaving it greasy nor heavy. Every single ingredient on the list is safe and beneficial for the skin [full list here], I love how there is absolutely no silicone in sight, and it gives a strong antioxidant boost without causing any sensitivities! I was recently asked which was the last beauty product that exceeded my expectations, and my first thought went to Shiseido Essential Energy Moisturizing Cream. Having tried as many products as I have, it takes a lot for any product to stand out for me. But after a single use, I was completely blown away. The silky cream is powered by a breakthrough Reneura Technology™ that focuses on our skin’s neuro-sensory functions, which then allows our skin to respond to the hydrating and nutrient-rich benefits of the moisturiser. Shiseido has also incorporated Ashitaba α Extract, derived from the native Japanese ashitaba plant that has strong regenerative powers, the extract protects skin against environmental damage, and grow more responsive and effective at repairing itself. A light layer applied at night left my skin looking practically glowing the next morning! Smoother, plumper, and just generally happier. Don’t take my word for it, try it for yourself! Everytime I put this away and return to it, the difference is immediately visible the next day. Priced at only SGD80 for 30ml, the Shiseido Essential Energy Moisturizing Cream completely exceeds every expectation I may have. Algenist’s philosophy and San Franciscan-origins resonates deeply with me, and I was first intrigued by the eye cream from this Elevate line as it contained gold to brighten the eye area. 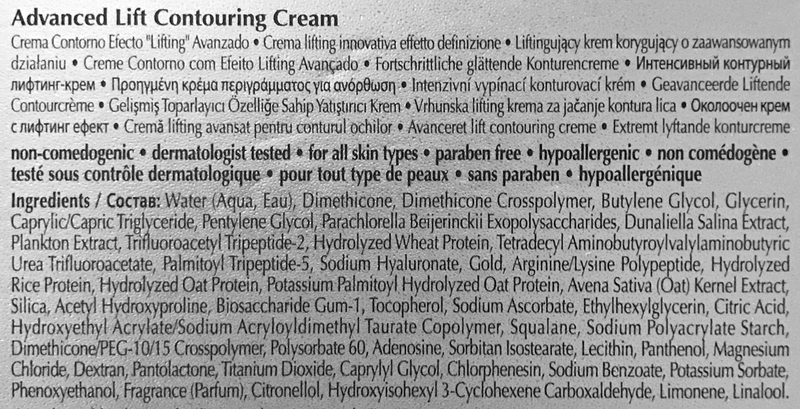 But the gem from the line is really imho the Advanced Lift Contouring Cream. Formulated with Algenist’s proprietary Alguronic Acid and Tripeptide-2, this cream claims to increase cell reproduction and minimize environmental damage, and firm the skin in under 10 minutes! The cream has a densely whipped texture that glides over the face like silk. Though I have not tried timing the effects, I have subconsciously stopped reaching for my wrinkle-serums every time I apply this cream. The most notable sign is the lifting and lessening of my nasal labial folds, which I’m most concerned about at this point. I’ve used it both with and without the complementing serum from the range, and if I have to choose 1 of them, my money will go to the cream unhesitatingly. For a full list of ingredients, head over here. Not the newest product in today’s pickings, but certainly new to my rotation. Designed to be a universal daily moisturizer, Fresh Lotus Youth Preserve Face Cream contains a blend of 7 botanical extracts that boosts hydration, fights free radicals, and minimises signs of aging. Full list of ingredients may be found here. I can definitely see why this is one of Fresh’s best-selling moisturisers because the cream feels silky to the touch and is lightweight on the skin. Although I personally think the 24hr hydration claim is over-reaching somewhat, I can’t deny that my skin feels amazing after a night of it. 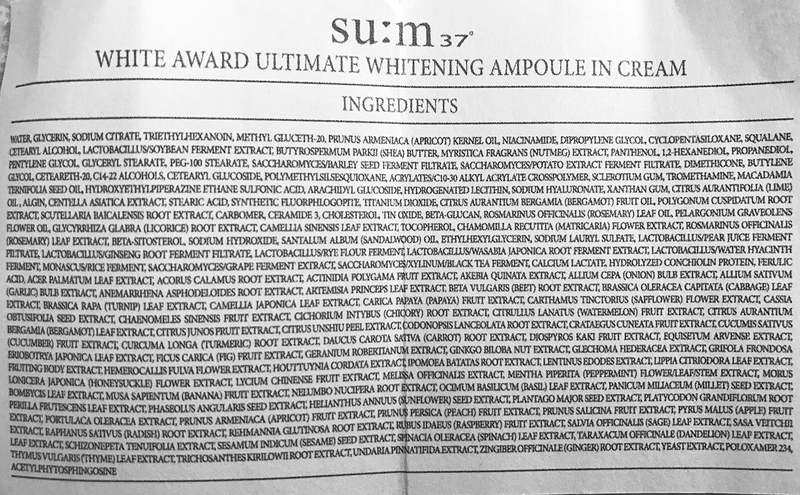 The latest and most novel face cream in my current stash is the Su:m37 White Award Ampoule-in-Cream. As its name aptly described, this latest cream from Su:m37 comes with a small packet of Micro Fermentation Pearl Protein Complex alongside a jar of cream. The concentrated active whitening ingredients are stabilised in pearl capsule form and sealed for ultimate freshness. Before the first use, you need to crack open the packet and mix it into the jar of cream. There is a spatula provided in the box that you can use to stir and mix thoroughly. Thereafter, you need to close the lid of the jar and leave it for 10 minutes, after which the fermented pearl ampoule capsules will have completely dissolved into the cream. This White Award Ampoule-in-Cream provides hydrating and whitening effects to the skin, brightening dull skin and increasing hyaluronic acid production to improve skin elasticity. You can view the full ingredients here. The cream has a somewhat jelly-like bouncy texture, and a tiny bit is all I need as it is quite rich. Hope you found something here that intrigued you. Now tell me, how has your summer been so far?